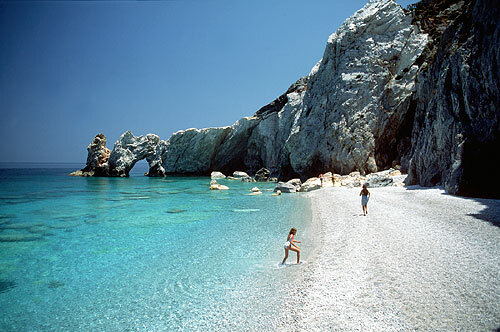 Skiathos belongs to the North Sporades island complex, it has an area of 49.898 km2 and a population of 5.468. Skiathos town is the capital and port of the island while Xanemos, Troullos and Koukounaries are the other main towns. From 1540 to 1829 the capital of the island was a fortified against pirates castle which was situated above todays capital. Just 4km from Skiathos town is the 18th century monastery of Evangelistria. Skiathos has approximately 70 beaches and most are ideal for water skiing and wind surfing, a few of these are Vromolimnos, Platanias, Kechria, Asselinos, Agia Paraskevi and Lalaria. The film Mamma Mia was partially filmed on Skiathos and nearby island Skopelos. Interesting information about Skiathos can be found through the Greek Travel Pages (GTP) and Wikipedia. Skiathos, which is situated on the southeastern side of the island. There are busses that connect the port with the rest of the island. Ferry connections and schedules for domestic routes, like Skiathos, are usually announced by most shipping companies, a couple of weeks before the beginning of each season. There are some exceptions though, like Blue Star ferries, which announces schedules in the beginning of the year. Information concerning ports serving routes to Skiathos can be found further down.